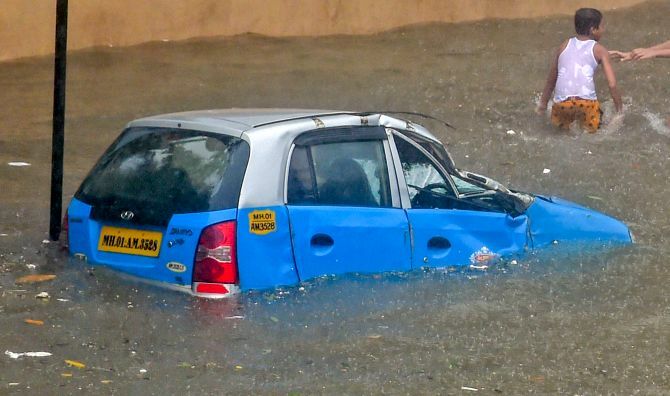 Local train services were hit and water-logging on the roads caused traffic snarls for a second consecutive day in the financial capital. 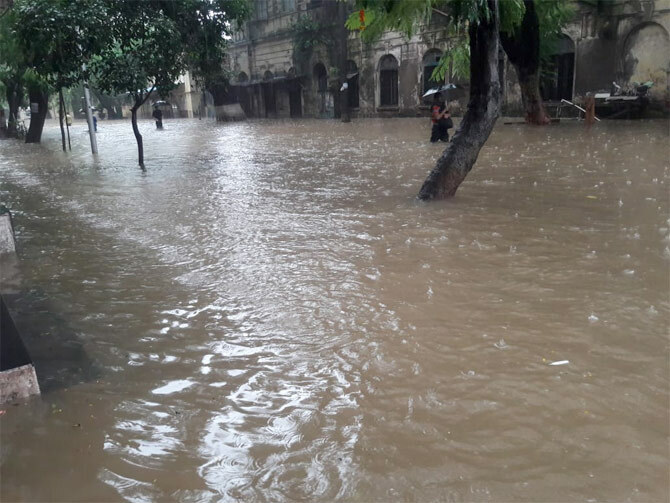 Torrential rain continued to lash the metropolis and its neighbouring areas for the second day on Tuesday, disrupting railway services and badly affecting normal life. 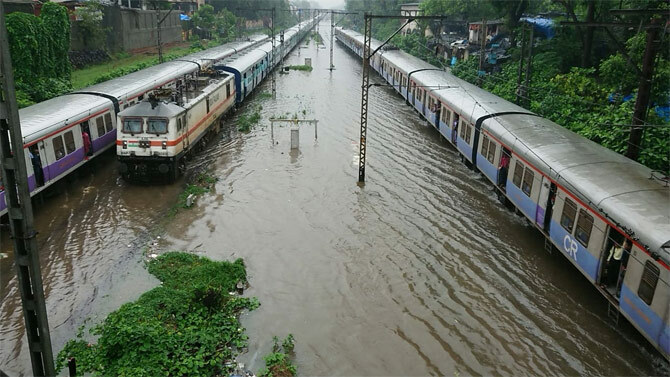 Suburban services were suspended on a section of the Western Railway (Virar to Bhayandar) due to waterlogging on tracks and several long-distance and inter-city express trains were delayed or cancelled, officials said. 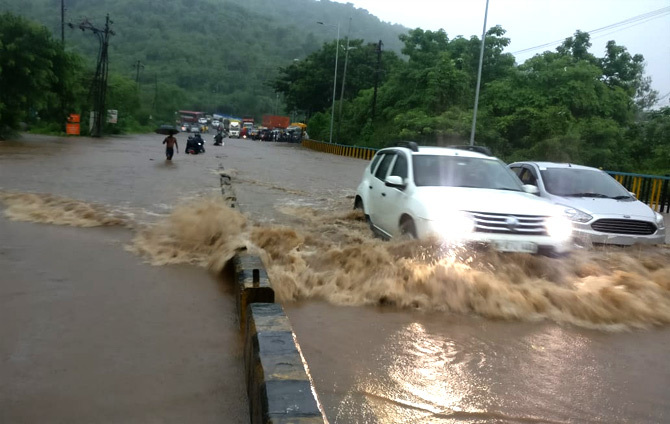 The downpour flooded many roads and streets in low-lying areas of the city and its adjoining districts of Palghar and Thane. People at some places were seen wading through waist-deep water. The Tulsi lake -- a major source of water supply for the city and its suburbs -- overflowed due to the heavy showers. Mumbai’s famous tiffin carriers dabbawalas, also suspended their services on Tuesday. 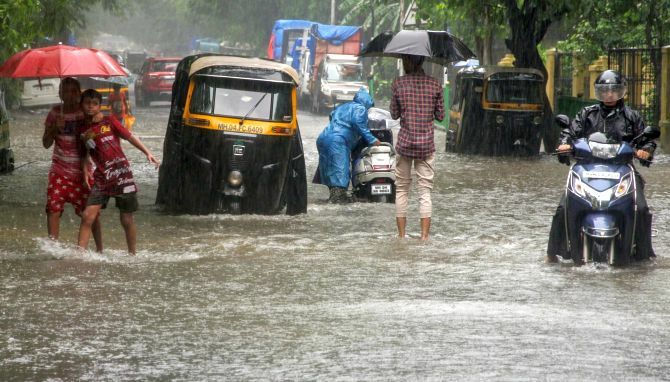 The India Meteorological Department has predicted heavy to very heavy rain till Thursday. 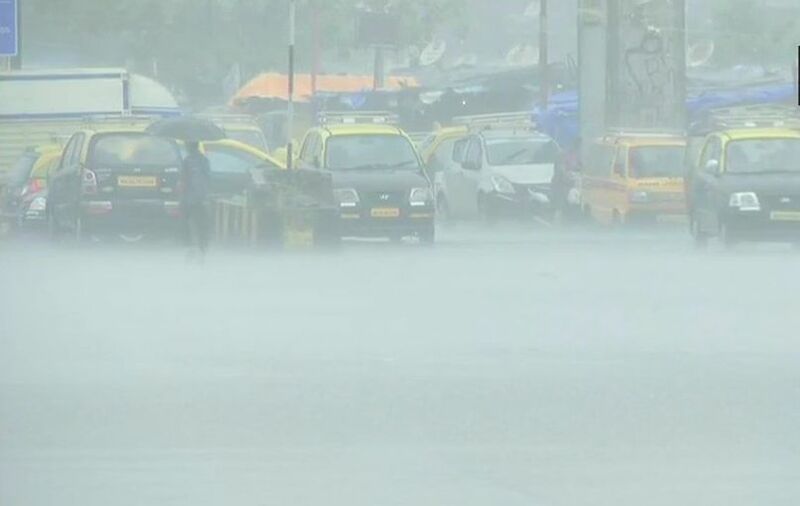 The IMD’s Colaba observatory (for Mumbai) recorded 165.8 mm rainfall in the 24-hour period of 8.30 am on Monday till 8.30 am on Tuesday. 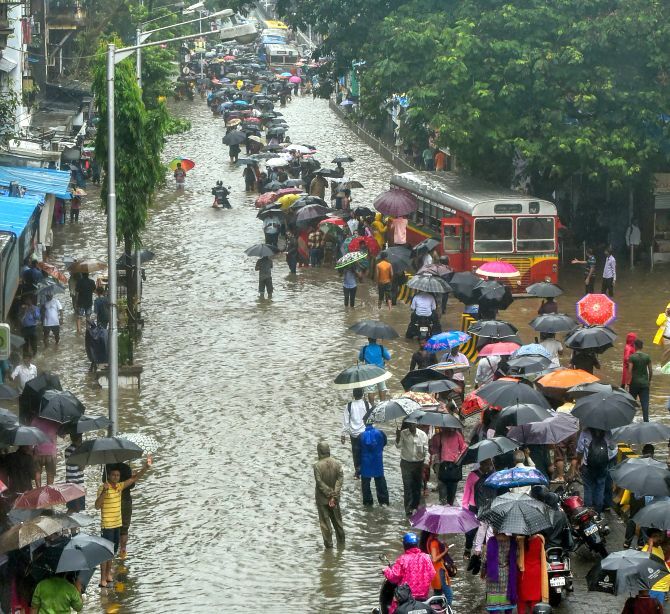 The Santacruz observatory, which records rainfall for suburban Mumbai, reported 184.3 mm rainfall in the same period. 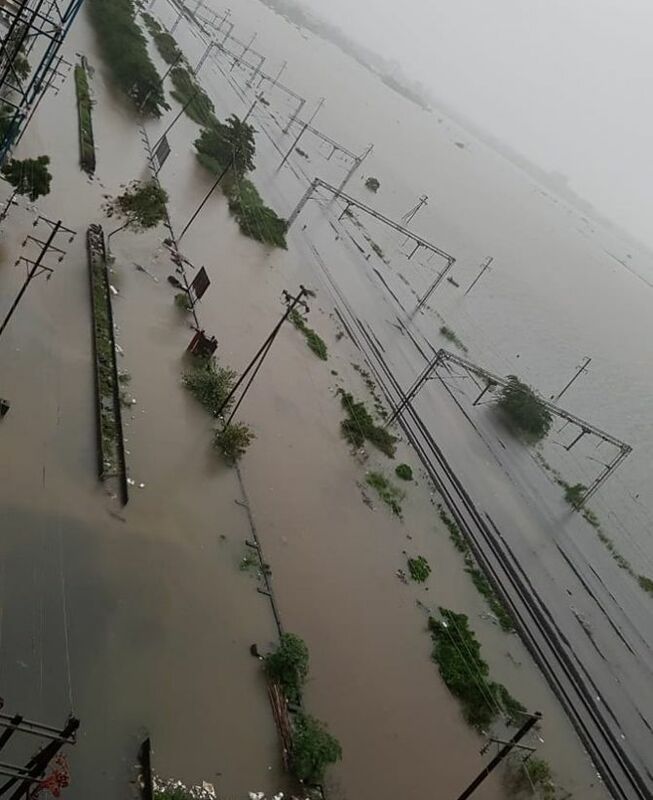 Since Tuesday night, over 200 mm rainfall has been recorded and this has led to waterlogging on rail tracks, a railway official said. Keeping in view the safety of passengers, services on the fast track between Vasai and Virar in Palghar district and that of the air-conditioned local trains have been suspended till the water level on tracks recedes, he said. 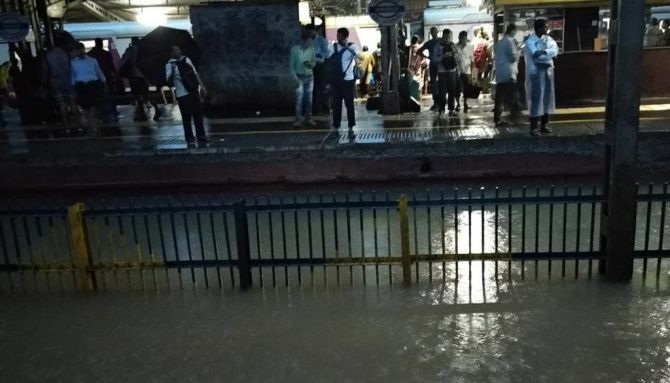 “Services of AC local have been suspended today in view of very heavy rains & water logging at/around Nallasopara, till further information,” the Western Railway said in a tweet. “Water very high from rail level at Nallasopara following heavy water accumulation in adjoining areas of tracks. Rail traffic suspended bet (sic) Vasai Road - Virar. Trains running between Churchgate & Vasai Road with delay,” the WR said in another tweet. In view of the flooding on rail tracks, the WR terminated and cancelled nine outstation trains, he said. Arrangements were being made to provide snacks and water to passengers of the long-distance trains that were delayed or stopped at various stations, the official said. The Central Railway’s local train services on its main and harbour lines were running late by 15 to 25 minutes, a CR official said. Three inter-city express trains were also cancelled, he said. Meanwhile, dabbawalas suspended their tiffin delivery services due to the rough weather. 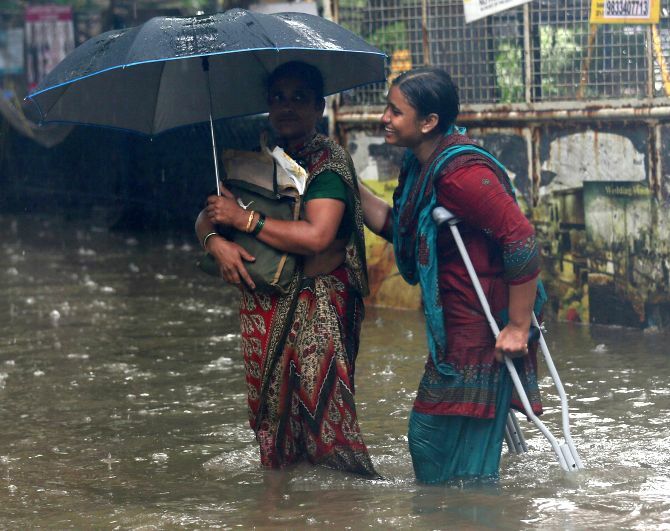 “We did not collect tiffins today because of the water-logging across the city. 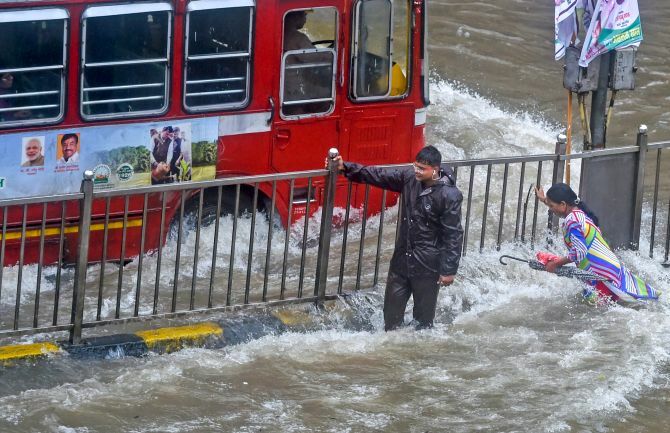 Our people were finding it hard to wade through knee-deep water on their bicycles,” Mumbai Dabbawalas’ Association’s spokesperson Subhash Talekar said. 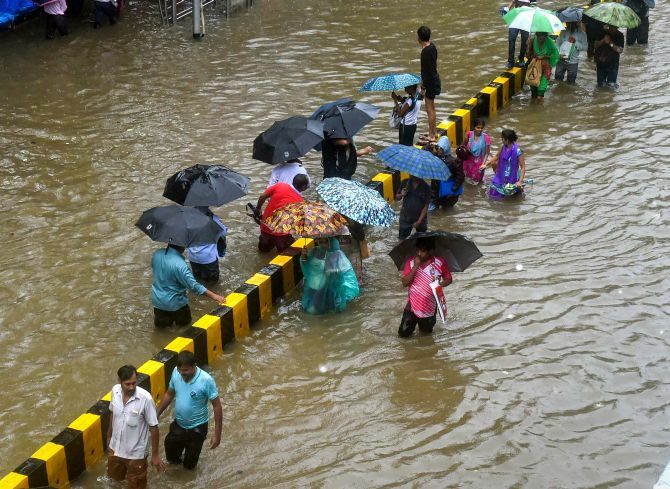 There were reports of waterlogging form several areas, including Hindmata, Parel, King’s Circle, Dharavi, Kurla, Sion, Bhandup, Vikhroli, Mulund, Dadar and Borivili, a BMC disaster management unit official said. “Vehicular movement was slow on the Western Express Highway. However, traffic movement on the Eastern Express Highway was normal,” he said. Brihanmumbai Electric Supply and Transport buses on 14 routes were diverted, a BEST spokesperson said. Maharashtra Education Minister Vinod Tawde has asked school principals to decided if institutions need to be kept open on Tuesday. “Instructed Deputy Director to ensure that schools in Thane and Palghar districts remain closed due to the erratic weather conditions. 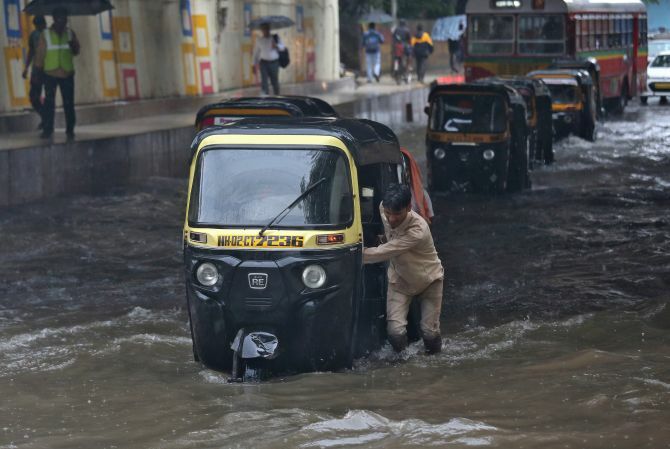 “In Mumbai, the principals of schools are instructed to take the call on school closure, gauging the waterlogging in the adjacent areas,” Tawde tweeted. The Brihanmumbai Municipal Corporation has asked people not to believe in rumours, doing rounds on the social media, of a cyclone approaching the city. 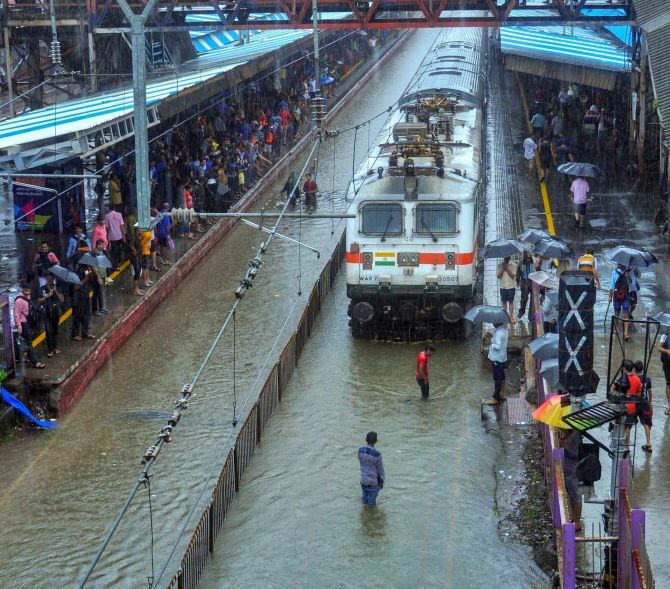 Local trains, considered the lifeline of Mumbai, on Tuesday moved at a snail’s pace due to water-logging of the tracks, resulting in harrowing times for lakhs of office-goers and other commuters. A distance, usually covered in about an hour, took several hours, even up to five hours in some cases, as the rail tracks as well as roads were submerged. 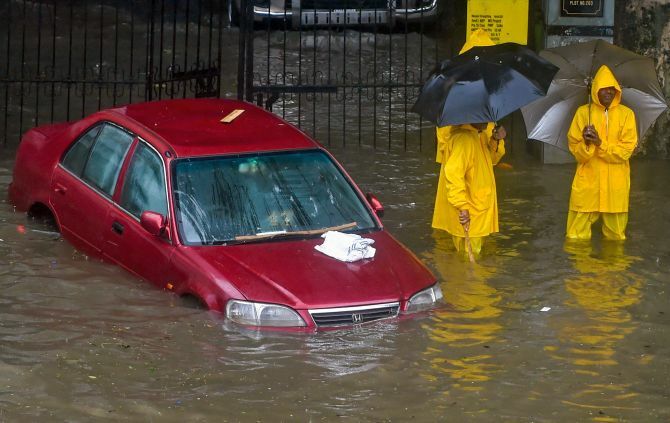 This was the scene of the metropolis as it continued to be lashed by heavy rains for the fourth straight day. “We have now become used to this,” said Ranvijay Singh Yadav while travelling from Navi Mumbai to Chatrapati Shivaji Maharaj Terminus by a local train. On normal days, the daily commuter’s 39-km journey would take him about an hour. Devendra Masurkar, a daily commuter whose travel from Thane to CSMT by a local train normally takes him 40 minutes, on Tuesday reached his destination after three-and-a-half hours. He said many office-goers, who got a train after waiting for hours, returned home midway as the locomotive was moving at a very slow pace and they felt they would be reaching their offices only in the afternoon. “Some of them ate their lunch inside the train and returned home,” said Masurkar who did not give up, even though he reached office late. “We face such the same situation every year but nobody seems to care,” he added.